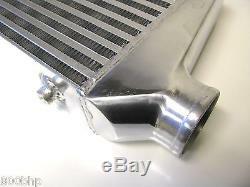 Universal Front Mount Intercooler (FMIC) 550x230x65 Core, 63mm Inlet/Outlet 2.5. 800bhp - Top Quality Products at Low Low Prices. Mounting Points Top and Bottom. Core Size 550mm x 230mm x 65mm (WxHxD). Overall Width 720mm at widest point (Inlet/Outlets), 590mm at narrowest point (top of end tanks). Inlet / Outlet 2.5 Diameter (63mm). This is a universal item and so we recommend fitment by a specialist, any questions please ask. The item "Front Mount Intercooler (FMIC) 550x230x65 Core, 63mm Inlet/Outlet 2.5 Universal" is in sale since Saturday, November 19, 2016. This item is in the category "Vehicle Parts & Accessories\Car Parts\Turbos & Superchargers\Intercoolers & Parts". The seller is "800bhp" and is located in Hinckley. This item can be shipped worldwide.